Remember when we used to update this all the time? Yes it has been awhile sorry Indy Reds. Just wanted to give everyone an update on the happenings around the OLSC. Sign ups end tomorrow so if you still want to play fill out the form here. For those that already signed up we will be contacting you soon to get your shirt size since we have to order them Monday. 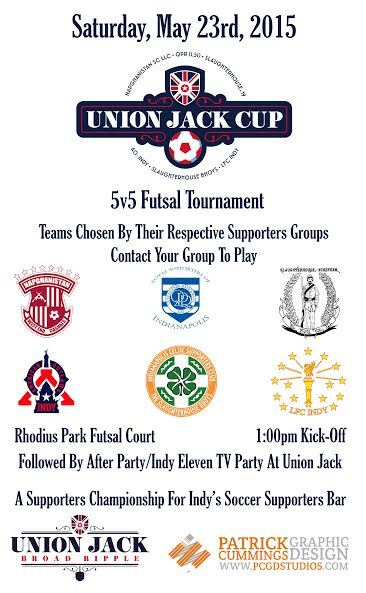 If you can’t or don’t want to play still come out and support the Indy Reds and all of these supporters clubs at the new Indy Eleven court that call UJ’s home and are helping to make it the best soccer pub in all of Indy. It will be a fun time of drinking and watching some sport plus a fun after party at UJ’s to watch Indy Eleven take on Ottawa. In other news we are only 3 games away from the end of the season. So that means we need to get this Annual General Meeting(AGM) going. It is something that is required by LFC for us to hold each year, going over our past year and then future goals for the upcoming year. It is also the time when you the supporters decide on how the supporters club is run and who runs it by nominating and electing our Board. Starting this summer through the 2016 season we will have 3 board members. If you want to nominate yourself or one of your fellow Indy Reds who you think would be a good fit for any of the 3 board member positions please do so by emailing LFCIndy7@gmail.com by 05/13. Here are the 3 board member spots below with a little bit of an overview about each position. Chairman: In charge of making final decisions for the Supporters Club. Helping to run all of the social media accounts and helping to guide the Supporters club in the right direction by listening and acting on Indy Reds requests and suggestions. Organizing events. Communicating to LFC requests/comments/concerns. Secretary/Social Media Coordinator: Will record any meeting notes for official meetings of the board and then also the AGM. Access to all of the OLSC Indy social media accounts(Facebook/Twitter/Website/Instagram etc) and email will help to post in the social media channels news and updates about LFC and the supporters club(Chairman will also contribute to the social media posts) responding to questions coming in through social media and through email. Now that our supporters club is official and we are continuing to grow and become a bigger presence in the community(hopefully for the better) it will be up to our board and supporters to work together to continue to grow and share responsibilities. With the new board we will be able to update the site more frequently with more posts and guest articles and keep everyone updated on twitter and facebook and hopefully a new instagram account along with getting more events set up with hopefully also more LFC Indy gear. It has been great seeing everyone come out still for the matches at Union Jack with the up and down year we have been experiencing. I TRULY believe the Indy Reds are the best fans here in Indy. To end the post we will leave you with some Stevie G Celebrations since we will only have 3 more chances to see him in Liverpool Red. This entry was posted in Uncategorized and tagged Gerrard, Indianapolis, Indy, Indy Eleven, Indy Reds, LFC, Liverpool, OLSC, YNWA on May 6, 2015 by LFCIndy. Hey there Indy Reds! Happy Friday and match day eve. Fan Focus for you to kick off your weekend. Then after the Fan focus repeat info about the T-shirts that are now on pre-sale. If we have your email you got the message last night. But before we go over the T-shirt info it is Indy Red Fan Focus time! How did you pick Liverpool as your team? I first started watching soccer in 1994 when the US hosted the World Cup. I had always tried to support our professional soccer leagues first and foremost. I started getting interested in the Premier League in the late 90’s, and started cheering for Americans playing there. Once Clint Dempsey (my favorite American player) was ran out of Tottenham, I decided it would be best if I picked one BPL team and stick with them. Liverpool’s fan support and passion is what convinced me immediately that I could relate to this club. My first official memory as a fully committed supporter was Gerrard imitating his kissing the camera after he scored the PK against Man U. Do you have any superstitions or traditions you do/have for each match? I always have to wear my scarf. I also feel our chances for winning increase if I am wearing my home jersey when they’re at home, my away jersey when they’re away, and my third jersey when they wear that. Where were you during Istanbul? Unfortunately, I wasn’t fully committed to LFC then, but I remember it being absolutely insane when I heard what happened and saw the highlights. Favorite Current Player and Why? 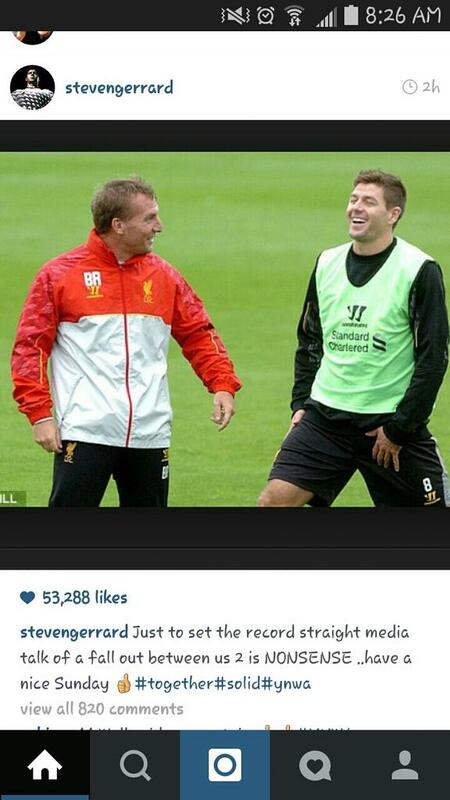 Stevie G of course. 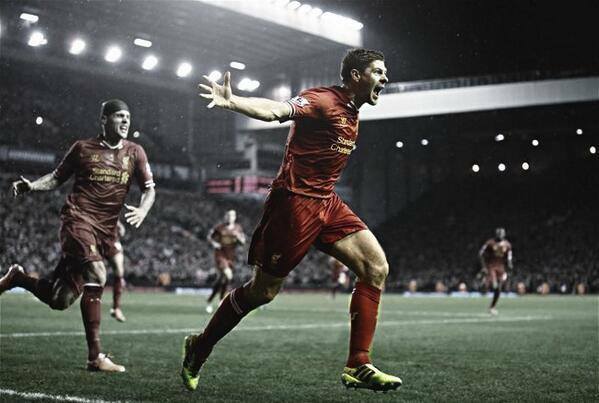 I love his passion and how Liverpool is his life. I definitely see the same passion in Lucas, and he is a close second. Hopefully we keep him around longer. If you could meet or have dinner with any LFC player/manager ever who it would it be & why? I am going to go in a different direction and choose Balotelli. Honestly, I think he gets singled out a lot for things that isn’t his doing. And I think the media loves to pick on him just to try to embellish their point on how he is a cancer to the team. I would want to meet and have dinner with him just so I can truly see for myself if he really is as bad as people really say. And to see if he does have that passion for LFC that every player should have. 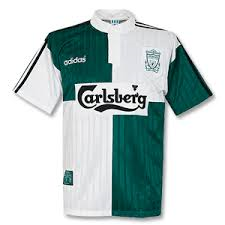 When I think of Liverpool kits, 2 things come to mind immediately: Red and Carlsberg. And since I love the Adidas trefoil and think that is a classic look, it is easy to say the jersey that puts all three of those things together is my favorite kit. 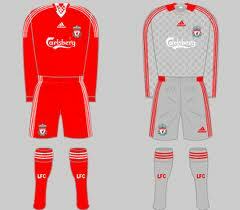 The 2006-2007 home kit. You are Owner of Liverpool for 1 day what do you do? Make one day completely free for people to have access to the stadium and its players. Give the people a chance that can’t afford seeing their favorite team an opportunity. Give them access to the training grounds, the locker rooms, the field, the game if there is one that day. All access pass to those that cannot afford it. Where do you go to get your LFC news/info? LFC have just won the league, where are you going for a celebration dinner in Indy Area? Where the Indy Reds are!!! UNION JACK! I saw promise in Markovic in Chicago, and I am happy to see he is starting to blossom now. I think he is a great signing with great talent. Have you ever seen LFC play in person? What other sports do you follow or hobbies do you have? Baseball, Football, College Basketball. Also enjoy discovering new music, and planning my next vacation to explore a new country and to see what this world has to offer! Best Local Indy Area Beer to have during an LFC match? Huge fan of Sun King, and their IPA’s. So whatever IPA of theirs is in season. What makes you most proud to support LFC? The passion of the fans. Without a doubt. Win or lose, the fans always stand behind their team. Best thing about being an Indy Red? Being able to interact with people that I know have the same passion for the sport as I do! Love seeing soccer become more and more popular after loving it all of these years. The absolute best thing though is the people I have been able to interact with on Twitter and can think of them as my friends. 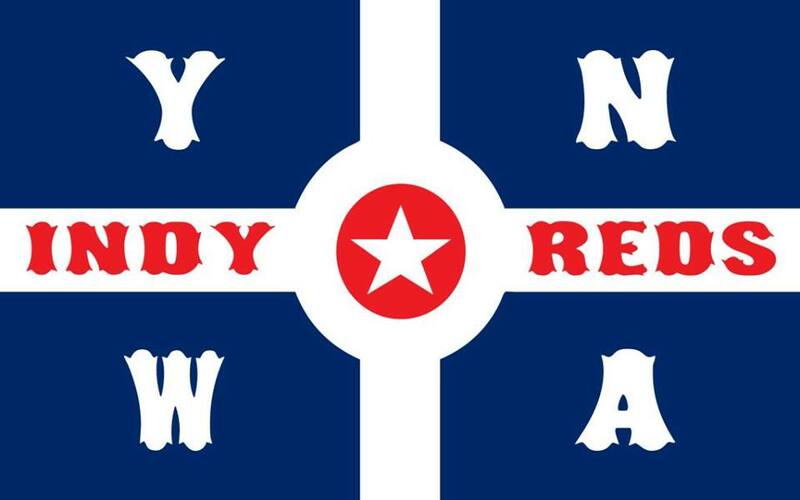 Being in the military, Twitter is how I can be a part of the OLSC Indy, and I am looking forward to being able to have a beer with my fellow Indy Reds at Union Jacks! Thanks Mike. As he briefly mentioned Mike is in the military and is actually stationed out in the Dakotas. 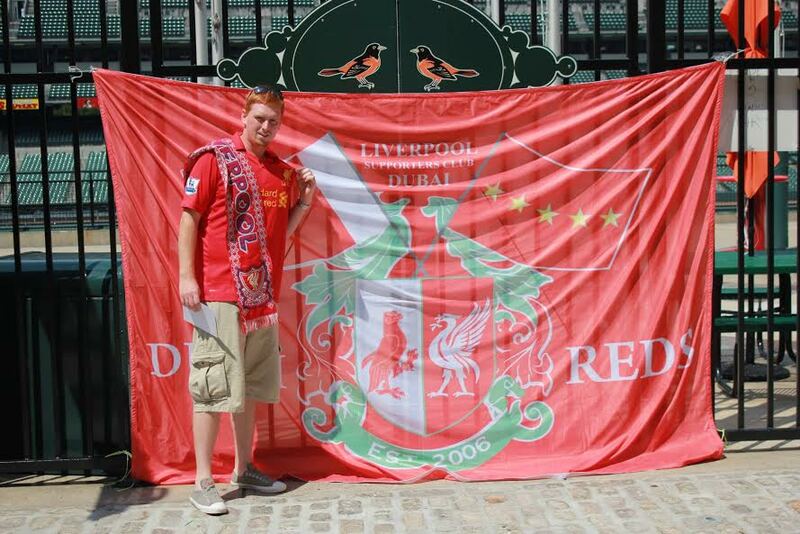 Look forward to him making it back to Indy to cheer on LFC with his fellow Indy Reds. Hi there Indy Reds! I apologize in advance this will be a longer email than normal. As you may have gathered from the subject line it is T-SHIRT TIME! Union Jack has finalized their design and pricing with their printers and we are ready to get pre-orders underway! The design above is what the shirt will look like. It had the most overall votes. Shirts will be $15 if you pre order it between now and next weekend 1/25. Once the pre-sale ends you will only be able to get the shirts at Union Jack after they are ordered and they will be $20 at the bar. It is $15 when you pre-order no matter what size you get and also the same cost if you get a men’s or women’s size. There is going to be 2 ways to get your pre-order and money in. You can either give me(Nile) cash at Union Jack on match day either this weekend Saturday 01/17 10am kickoff v Villa or Tuesday 01/20 2:45pm kickoff v Chelsea and finally Saturday 01/24 12:30pm kickoff v Bolton. The other way to pay is we have a Paypal account set up. Link is below. You can click on that and order a shirt. If you want multiple shirts you have to do it multiple times(sorry) and when you order you need to put in the “special notes” the size you would like. If I don’t see a size I will email you but you’ll make our life easier if you put it in the notes. If you plan on ordering through Paypal please do so as soon as possible. Once the order is placed the money doesn’t show up for 7 days for us to transfer to UJ’s to get the shirts so it delays it some. So that was the good news. Now some possible not so good news. If you like the LFC Indy logo & you want to show it off I HIGHLY SUGGEST you get one of these shirts. As you may know LFC is reviewing and adjusting their trademarks and branding(hence why we don’t have scarves yet) because of this it is looking like all the Supporters Clubs will have to submit their logos to LFC for approval. Word through the grapevine is that LFC is really putting the clamps on things and it is a possibility that our logo will not be accepted and have to be modified. Thankfully we have some great artistic people that are Indy Reds, so if it does come to that finding an approved logo will be no big deal. SO if you like the logo get a shirt because it might possibly be the only item in our short existence that will have it on any apparel, plus how cool is it you get to rep the best Soccer Pub in Indy along with the best Supporters Club! Alright everyone excited?! We’ve had some Paypal pre-orders rolling in today. If you will be at one of the next few matches you will see me(Nile) in my usual spot on the upper landing by the Window. You can pre-order and pay in cash in person during matchday with me. Lallana has made a speedy recover and could make the bench this weekend for the match. If he doesn’t he is for sure with the team v Chelsea next week. Daniel Sturridge is back in training which is a great sight to see. Will be amazing to see him back in the lineup and out there running wild soon. Raheem Sterling is back from his holiday in Jamaica and back with the team. Alright keep those pre-orders coming. 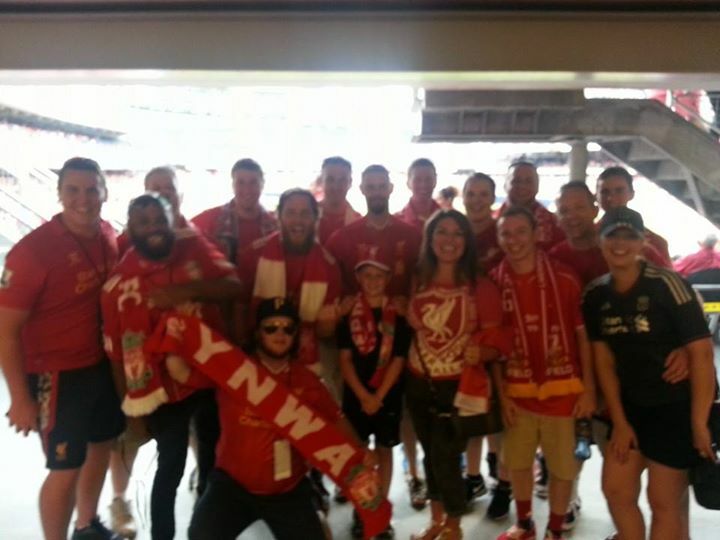 Look forward to seeing all of you Indy Reds at the match tomorrow 10am Kickoff v Villa. Be sure to get there early because QPR v mancs is on at 10am too, so expect a crowded Union Jack. This entry was posted in Indy Red Fan Focus, Uncategorized and tagged Fan Focus, Indy, Indy Reds, LFC, Liverpool on January 16, 2015 by LFCIndy. Fan Focus. Don’t go Hibernating. Though I played club and school soccer throughout my youth, I burned myself out and stayed away for several years. I first dipped a toe into the EPL waters in 2008, and the Reds stood out, especially emotional players like Stevie, Pepe, and Carra. I was drawn to these players because they reminded me of my favorite NFL players like Jim Kelly and Darryl Talley. I was hooked. The first major memory for me was the 2010 victory against Chelsea in which Fernando Torres regained form (we thought) and punched in 2 goals. I had been hoping for him to regain a high level for so long, and coupled with club turmoil, being Hodged, and league position- it was an immense relief. Short-lived, but very important to me at the time. 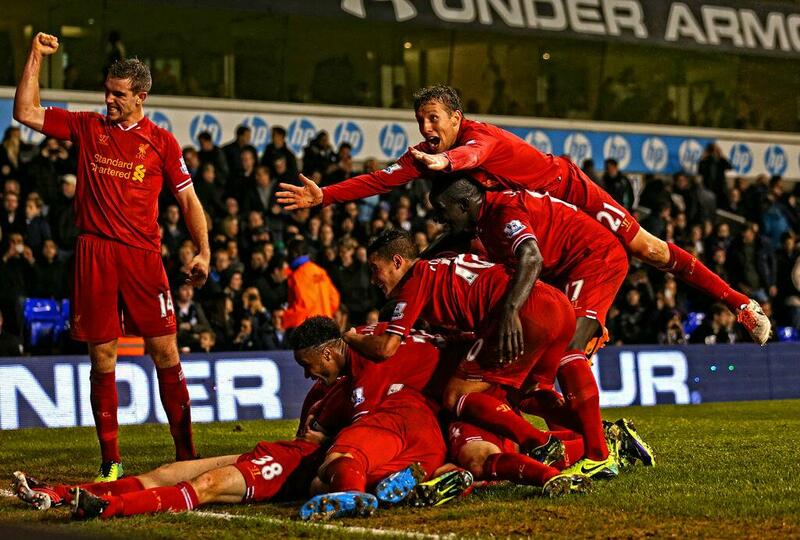 Tottenham 0 – 5 Liverpool, the celebration after Flanagan’s goal. I’m not superstitious, but lately it’s been nice to get a 45-minute ride in before a match to ease the nerves. If you could meet or have dinner with any LFC player/manager ever who it would it be & why?The King, Kenny Dalglish. He’s been to the peaks and depths with the club. 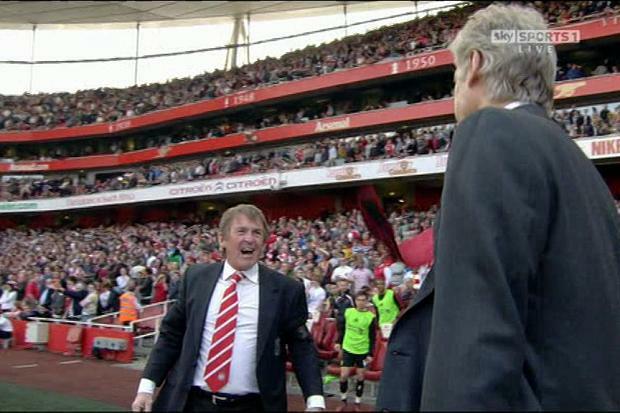 Plus, I really enjoyed him telling Arsene Wenger to f*** off a few years back after an extra-time penalty equalizer. Book a friendly at Lucas Oil Stadium. Bronze statue of Ian Ayre. LFC have just won the league, where are you going for a celebration dinner in Indy Area? I really dig the food at Twenty Tap. And Chatham Tap. Most taps. It would be a dream to see Ibe take a step and impress during his loan spell at Derby County. Young Phil C’s winner vs City in the heat of the title race last year was amazing. We went to Soldier Field for the friendly against Olympiakos. Buffalo Bills since 1988 home opener….and all of the suffering since. My favorite central Indiana beer is Bloomington Brewing Co’s Rooftop IPA. I hope we’re part of something that endures as this beautiful game continues to gain popularity in the US. And though I’ve only attended a handful of group events, we really seem to have an incredible local following. Well Indy Reds we’ve had a rough few weeks watching our Redmen play. But as always we will try and find some positives. Still in the Capital One Cup and FA Cup and even though we were bounced out of the Champions League we did drop to the Europa League. So we have that going for us. Even though the loss to united was a rough one we attacked much much better we just couldn’t get anything past De Gea. Speaking of the match from Sunday. Huge thanks to everyone that came out to Union Jack. The place was packed. It was great to see some new faces there and always good to see the trusty regulars each week. Lets keep that support going. Tomorrow(Wednesday) ULF Podcast will have their clips up from the match since they broadcasted live from there. 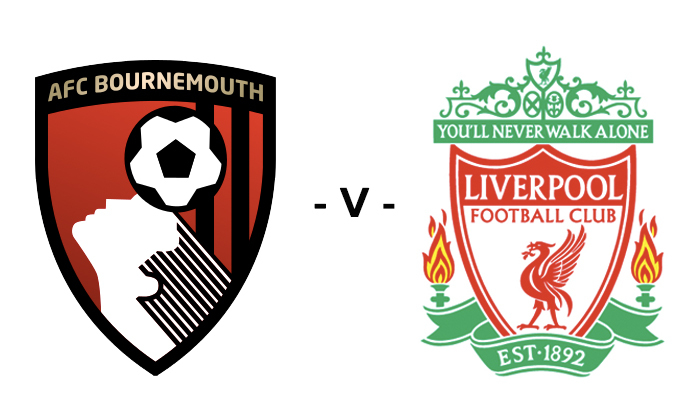 LFC will take on Bournemouth in the Capital One Cup Wednesday 2:45pm kickoff. Here is the press conference from BR Only injury update right now is Glen Johnson will be out for the holiday season clashes with a groin Injury. Sturridge still out. Sakho, Mario and everyone else should be good to go. Any Lineup predictions for the midweek clash? Contrary to reports Rodgers says there was not a “Bust Up” or unrest in the team. Sunday another huge EPL match with a primo kickoff time. LFC v Arsenal. 11am kickoff. If you’ve never been out to UJ’s for a match these are the ones to make it to your first. Perfect start time. Food will be going, plenty of time to wake up. Another big big crowd expected at Union Jack. Lets make sure that it is full of Red before the blue of the Colts try to take over. 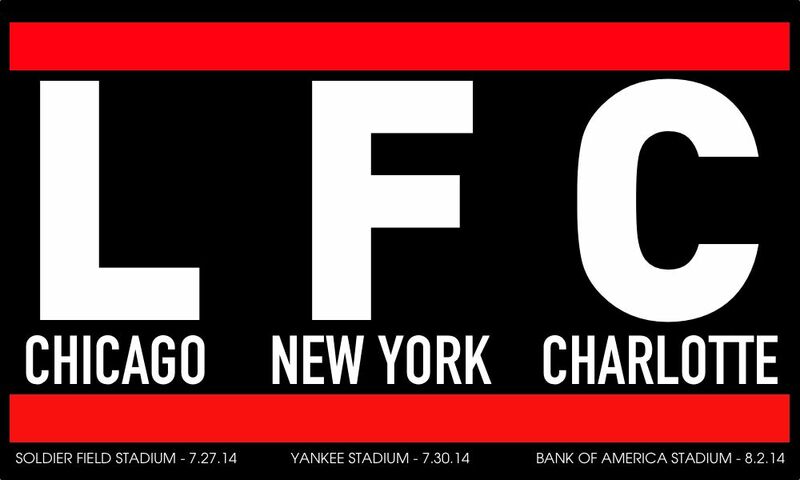 LFC emailed earlier this week they are still finalizing the new branding so no new scarves for a couple more weeks. The minute I get the ok the Wheels will start to turn fast for pre-orders and to get them in. In other apparel developments. Union Jack is in the final stages of having t-shirts made that will incorporate both our logo and theirs. Once I have a picture of the final design I will post it. Pre-sale of them will be open to everyone(Trust me you will want to get the shirt on pre-sale will most likely be cheaper than getting it at pub after pre-sale ends) So you can get your Indy Reds fix before the scarfs happen. It will be a great chance to support both our local home pub and your supporters club. If you didn’t get an email from us last week please make sure to get us your email address so we can add you to our list, will be very import for passing along big info. Reminder if you ever have any ideas for articles or posts for the site please bring them to our attention or if you have wrote something or want to write something please let us know so we can add more content. 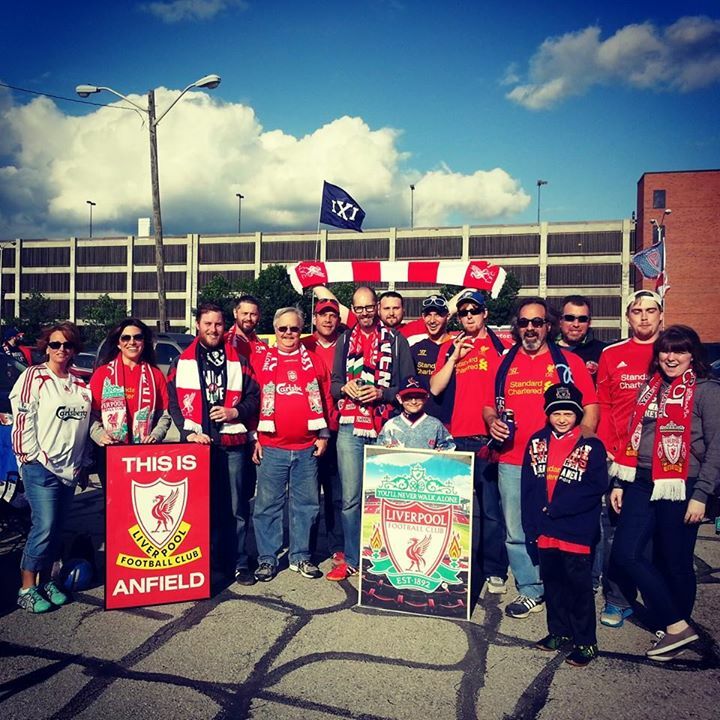 This entry was posted in Indy Red Fan Focus and tagged Fan Focus, Indianapolis, Indy, LFC, Liverpool, MatchDay, OLSC, YNWA on December 16, 2014 by LFCIndy. Fan Focus Chairman of the Board, No not Sinatra. 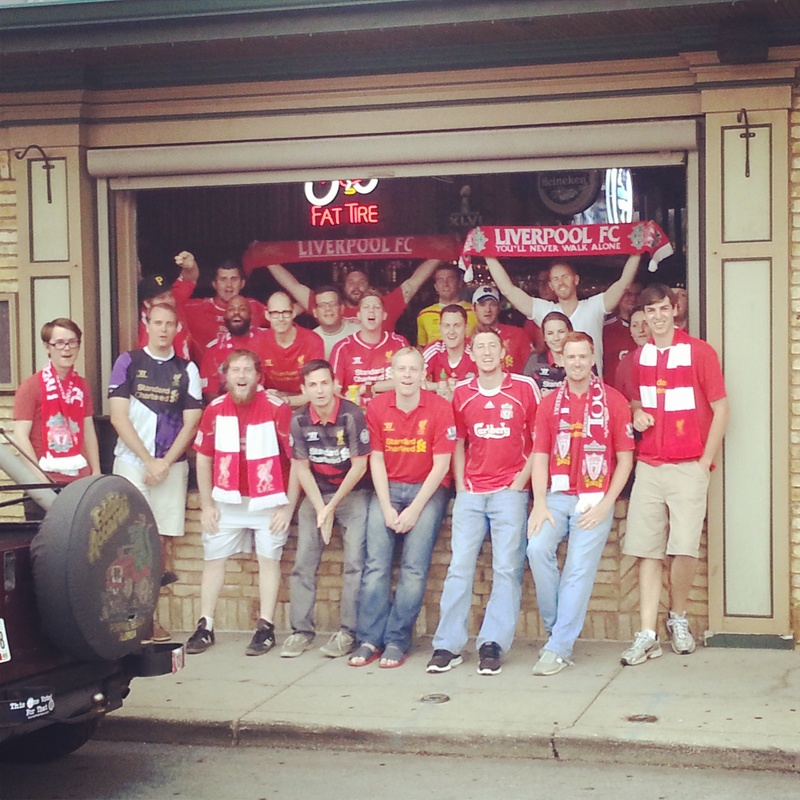 Welcome back Indy Reds to another edition of our Fan Focus. This week in honor of gaining OLSC status I thought that I would get in on the fan focus action. 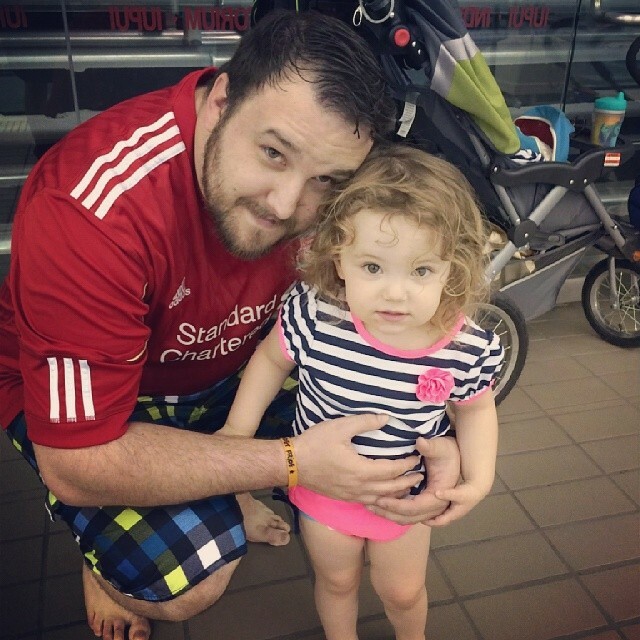 I added a little backstory for how LFC Indy started for those that wanted to know the story. Over the past year I’ve met quite a few of you Indy Reds and some of these questions and answers have been done in person but for those that haven’t thought I would “pull back the curtain” a little. Hope you enjoy. 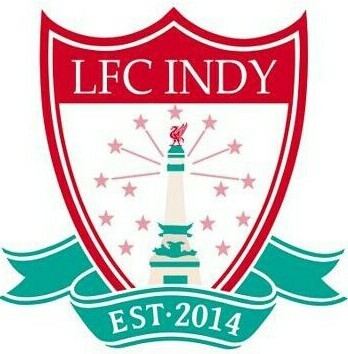 What are the origins of LFC Indy? First we needed a home pub so after about a month of going to different Pubs I decided to land on Union Jack pub to be the home place. Chatham downtown would of been great but Chelsea, Arsenal & Spurs all have supporters clubs that meet there and I was kind of selfish I wanted a place to call our own, plus it is only 21+ and it is a little smaller. Chatham in Fishers almost became the choice because it is spacious and they do allow all ages but it just seemed like a long ways away. So Union Jack seemed like a happy medium. It is in Broad Ripple, they have great food and beer. They had young owners who took over and nobody else was going there. 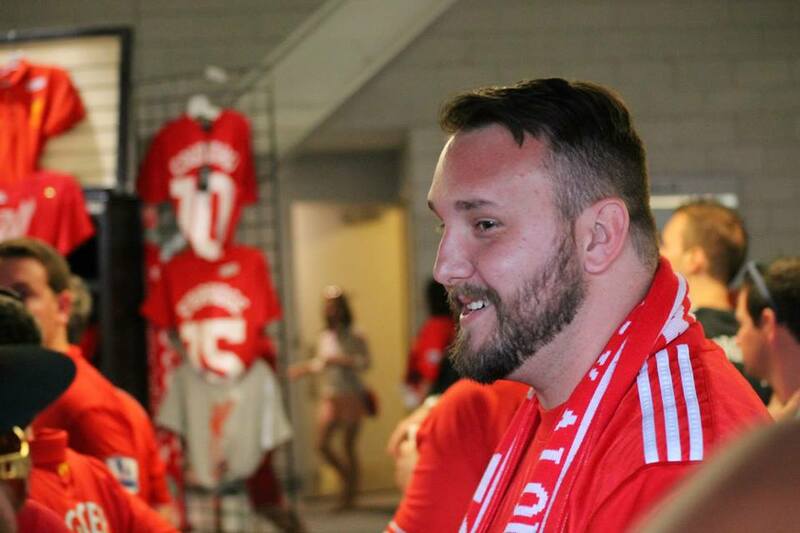 Once that happened things started to snowball and escalate quickly(faster and more organized than I ever expected) We started getting a lot of followers on the twitter page and then LFC announced they were coming to the USA for a summer tour and wanted to interview some supporters and for some reason they picked me. The exposure we got for being on the website exploded. Around this same time Indy Eleven was getting ready to start so lots of soccer fans were together and Indy Reds starting meeting each other. More and more people wanted to be a part of it and were buying LFC memberships and we blew away the number required to become a Supporters Club. More and more people started showing up to matches and here we are today still growing. Still amazed that it grew that fast in one small year. First LFC memory? 08/30/2003. I was a freshman in college at Baldwin-Wallace in Cleveland. I walked out into the commons room area in our dorm and there was a soccer game on. Red v Blue. 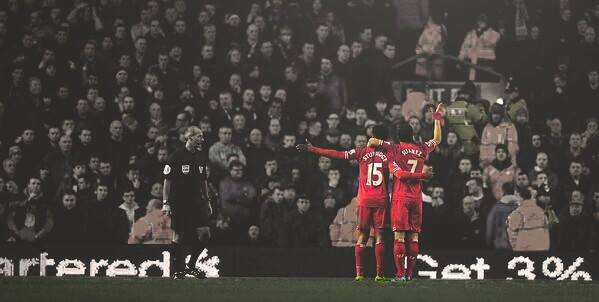 It was the Merseyside Derby. I sat down and watched the match and watched LFC win 3-0. I was hooked. How did you pick Liverpool as your team? It was the perfect match. Where I grew up in the Amish Country of Ohio(Holmes County!!) nobody really ever played or watched any soccer at all so I was never exposed to it at a young age to fall in love with it and play it. Growing up in Ohio I was brought up a die hard Cleveland Sports fan. Yes a horrible thing to do to a child as you may know Cleveland sports is sometimes nicknamed “The Factory of Sadness” Cleveland teams used to be all very good and won some championships back in the old days and then they also had lots of times where they were so so close to winning and being the factory of sadness they would come up short(The Shot, The Fumble, Red Right 88, Jose Mesa, The Decision, the list goes on) Cleveland fans though are a very proud bunch and they support their teams through the best times and the worst times and those teams are steeped in history and tradition. Long story short after I saw that first LFC match I dug into the club and wanted to know the roots/history of it. Only thing I knew about Liverpool was The Beatles were from there and I loved them. They were also Red. Which it sounds small and petty but that was a major factor. Red is my favorite color. I am an Ohio State fan so Red over Blue is something ingrained in you too. I started to see some similarities between my beloved Cleveland teams and LFC. Both had very rich histories and were at a time in the past kings of their sports, then of recent they both had chances to win but came up short but the fans always stuck by them. The more I learned about the club and the more I watched them the more I grew to love them. Lots of great memories especially here of recent. Hard to not say Istanbul though here. That will be a game that goes down in History as THE single best comeback in sports history and one of the most exciting matches of all time. So that is obviously up there. 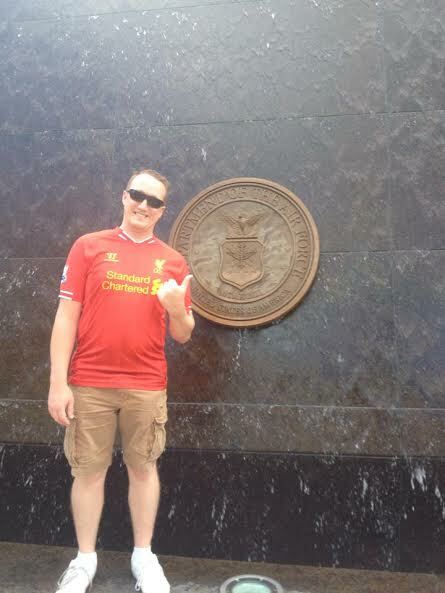 Also up there was seeing Liverpool in Chicago. I was lucky enough that I got to go see training the day before the match, so it was a great experience to see the team up close with a very small crowd and hear & see the players and coaches interact with each other and also with the fans. Will never forget we were singing a Steven Gerrard song and the one and only Stevie just looked up right as and smiled and gave the thumbs up. 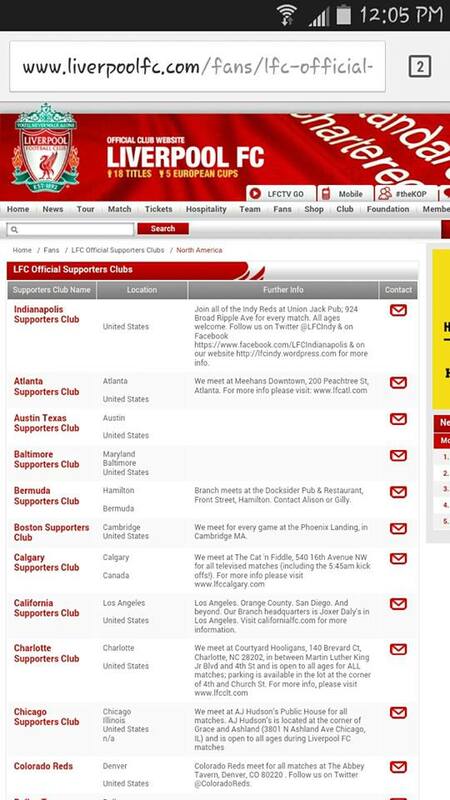 Getting the email that said the LFC wanted to offer LFC Indy official supporters club status will always be a fond one too. Have to listen to You’ll Never Walk Alone. 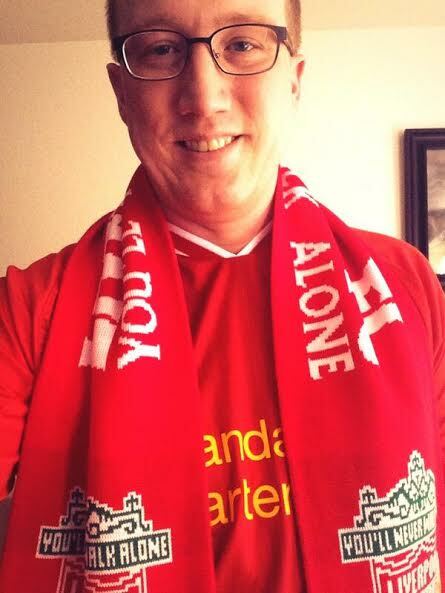 I kiss the Liverbird on my scarf before kickoff. 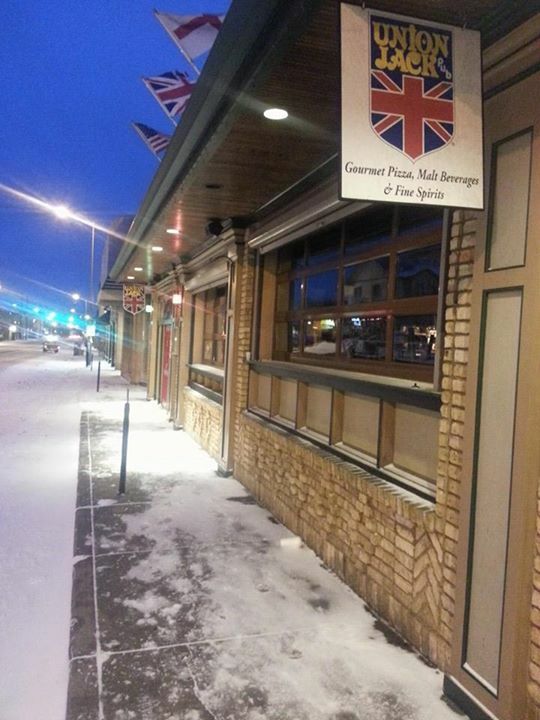 I was at our home pub Union Jack. Rough rough 1st half and I was drowning myself in a few pints thinking, yep I’m destined to never see one of the teams I support win anything. Then Holy Moly, that 2nd half. I can still watch that 2nd half and get excited and cheer watching it. Had plenty of beers to celebrate and luckily I lived in the neighborhood area so I was able to make a stop at the Red Key as well to celebrate. Stevie G will always be my favorite player because he was one of the 1st players I watched and he has been the ultimate Liverpool player and he is freaking Stevie G you can’t put into words what he means to the club and fans. Other than Stevie, Raheem Sterling & Daniel Sturridge are two players I love to watch. Bob Paisley. He seems like someone who would of been excellent to just belly up to the bar and have some beers and chat with. I’m sure he has phenomenal stories of those great teams he was associated with. 2008-2012 Adidas Home kit was one of the best ever. Simple, clean Looked sharp. 87-89/08-09 Gray away kits were great. Then I do have a soft spot for the 95-96 Green&White Quarters away kit. I for some reason love the quarters design. Would love to see that brought back. First order of business is give myself a job with the club so when the day ends I still work for LFC. 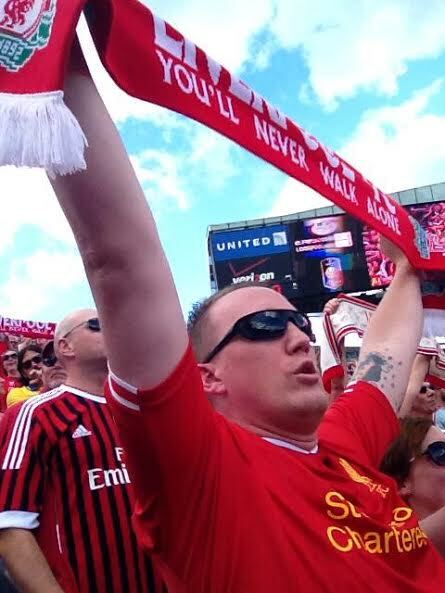 Second order of business is make sure LFC tour the USA in 2016 & have a stop in Indy. Third open up a USA based academy in Indy. To home grow some players from the USA to join LFC in the future. Bring over some former players Rush, Barnes, Fowler to be coaches/advisors. Twitter mostly. Liverpool website, This is Anfield. Celebrating with quite a few pints and a pizza at Union Jack. Then once I get home Chips, Salsa, Queso, Quesadilla A La Diabla from Fiesta Ranchera. More pints. Then next day more celebration with meal downtown. Before season started it was Ibe, but then we sent him on loan. He was a fun one to watch in training in Chicago. Emre Can was a player I want to see play some more. He is just a big bull who is fun to watch. So many great goals. Long strikes by Stevie, that chip from Suarez v Norwich. One goal that I really liked that I always think of is Daniel Sturridge v Stoke in December of 2014. Ball got played into Studge in the box he hits it GK saves it ricochets off the post, Studge is now past the end line sees the ball, slips but gets up and bounces the ball off his head like a circus seal and then drops it to his foot and puts in the goal. It was just that determination that “I’m going to score this goal and not let up” that I loved. Video below at the 2:00 minute mark. I have. When they came to Chicago I saw them train and then also watched the game the next day. Great experience. 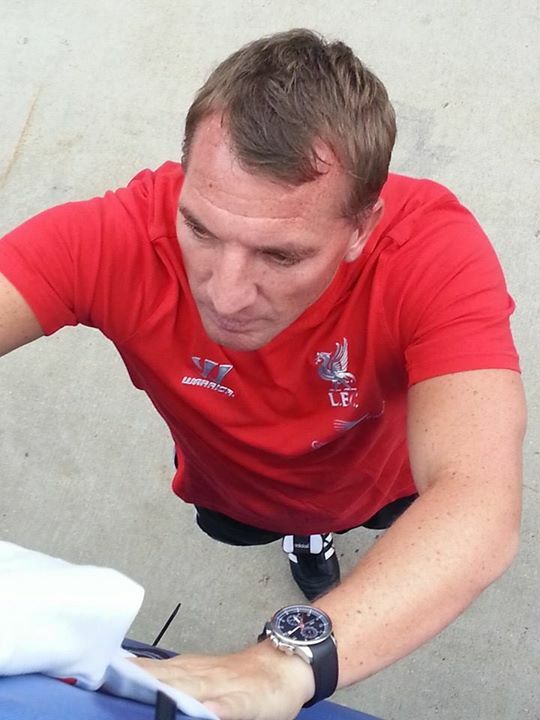 Got to meet Brendan Rodgers and he signed my scarf. Met lots of supporters and some of the other chairmen of other supporters clubs from throughout the USA. Got to sing YNWA which was great. I never expected for them to put this in the Program for the USA tour. If you were at Chicago you saw me geek out when I saw it. I follow all Cleveland sports(Indians, Cavs, Browns) Ohio State Buckeyes, Indy Eleven, I also follow the Pittsburgh Pirates close too, My wife and her family are from the Pittsburgh area and then the AAA team is here in Indy and I’m an Usher at Victory Field on the side so I have grown to love watching their prospects and players. I enjoy a good beer. I still like to get out there and play some rec league softball & I played in the Indy City Futbol this past summer. When I went to veg out I have an Xbox One so you will see me playing FIFA & some RPG’s. Other than that I am married and we have a 2 1/2yr old daughter Chaylee and as of writing this in a few days my wife will give birth to our second child a Baby Boy named River. I love spending time with our little family so that takes up majority of my time. Mashcraft on the Southside had a Scots Ale earlier this year that was one of the best beers I’ve had. I usually lean towards a porter or red style beer but the great thing about Union Jack is they always have a great rotating tap list so it gives you the chance to try lots of different beers. The phrase “You’ll Never Walk Alone” It truly is the calling card of the club. 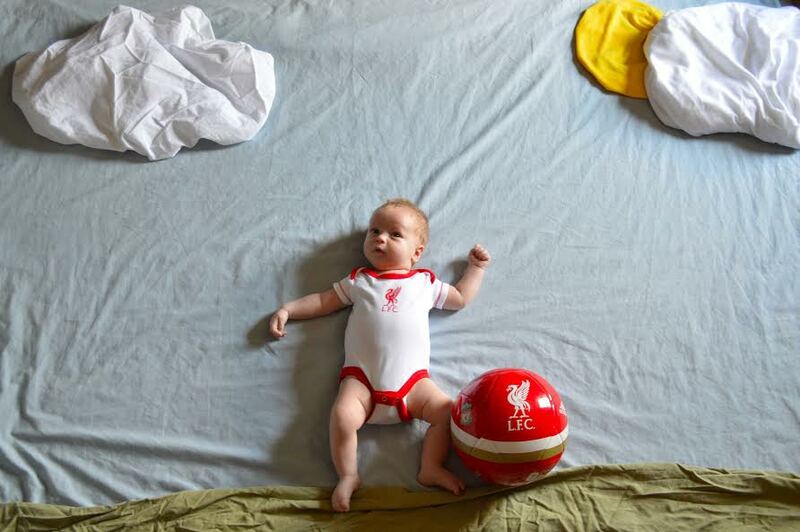 It is that sense of community and family when you support LFC. Proud that we are an OLSC and that we got it so fast. Great being able to watch matches and interact with so many different people in the city. Thanks everyone again for helping us get to official status. Reminder Saturday 7:45am kickoff. Get to Union Jack for the match to celebrate us becoming an OLSC. I will be bringing in donuts for the early morning match. UJ’s will obviously have the beer and coffee flowing. Should be a good crowd there since we are playing the team that is easy to hate(and for good reason) CFC. All ages welcome. Get out there and meet some of your fellow Indy Reds and kick your weekend off right with some Indy Reds and 3 points. 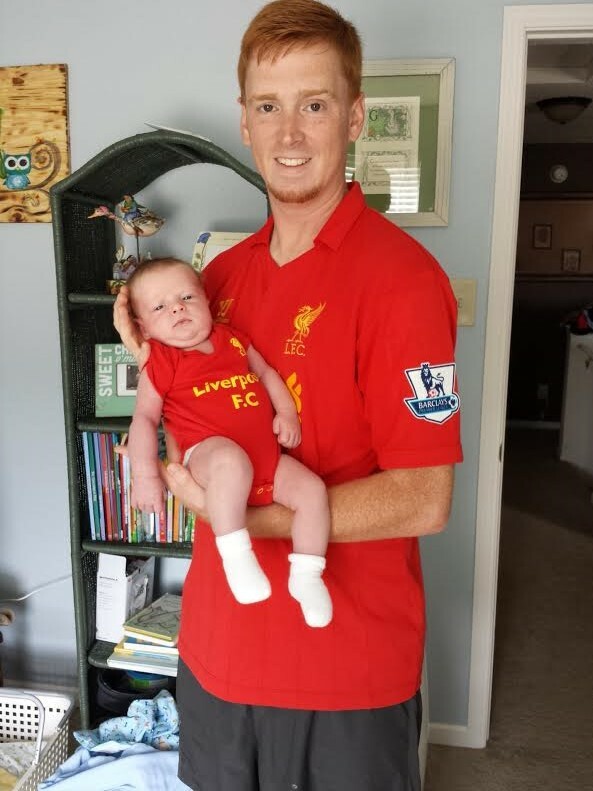 This entry was posted in Indy Red Fan Focus and tagged Fan Focus, Indianapolis, Indy, Indy Reds, LFC, Liverpool, OLSC on November 6, 2014 by LFCIndy. 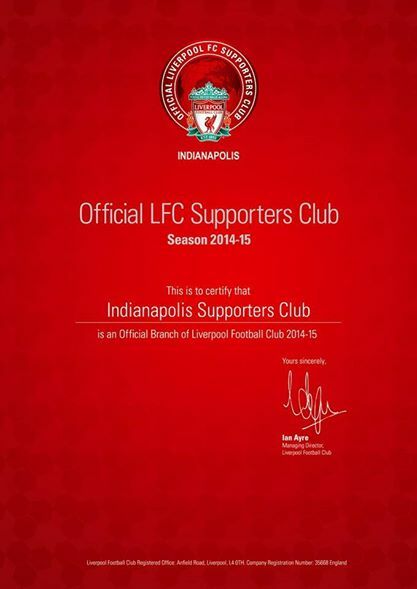 As you may have heard or seen by now on the Morning of 11/03/2014 LFC Indy was offered and invitation by Liverpool Football Club to become an Official Supporters Club! Yes we did it! Amazed at the quickness of the growth and organization that we have done here in Indy in just One short year. If you have any other ideas post them on our Twitter/Facebook page or in the comments. Only thing I can think of that needs to be added on this would be maybe a “EST 2014” since it is our Inaugural scarf. After that we just need to continue to grow and keep getting the word out and keep getting new people to Union Jack’s and getting more people out to UJ’s for the match. Place should be packed each week for matches. Other than that we will look into getting OLSC cards for people who have LFC memberships & working with Union Jack on t-shirts. Also we will look to do some community projects or donating. Food drives, taking money from scarf sales and using it to buy soccer equipment for a local youth team etc. Massive thank you to Union Jack Pub who over this past year has helped us to grow and has helped to get awareness out there about us and continue to open up their doors early & are striving to become the best Soccer Pub in Indy. Jay and his staff have been great and we look forward to continuing that relationship with them and keeping UJ’s as our home pub. Obviously a giant thank you to all of the Indy Reds who during the past year kept helping us build. We had a big response when we first started this thing and it has just snowballed. You guys blew me away with the amount of mentions/follows/rt’s etc each and every single day. I was stunned to see the support that was thrown out there when we really decided we were going for it on becoming an OLSC. We over doubled the number or requirements needed to become an OLSC in both members and members with Liverpool Memberships. Heck of a job. We admittedly had something of a perfect storm when we started this. We had an amazing season last year which always brings people on board. The World Cup happened which always shines the spotlight on the sport. 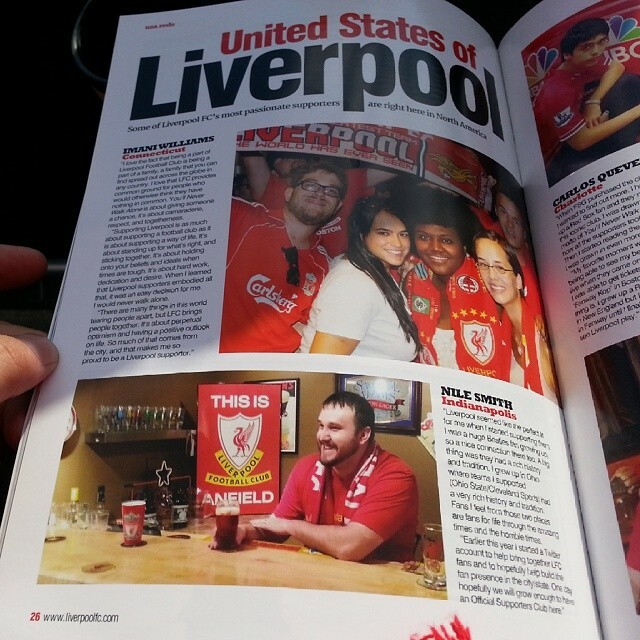 We had Liverpool come to the USA and Chicago which gave us some great exposure. Indy Eleven started their inaugural season which helped to gather lots of fans together each week & helped to bring awareness to our Supporters Club. I don’t want to single out any specific Indy Reds, you know who you are; Thank You. There have been a few of you that have been on this train since Day One and even before and have been instrumental in getting the word out there and creating a buzz and being a shining example of what it is to be a Liverpool fan and doing things The Liverpool Way. Thank you to the Liverpool USA account. Nile getting interviewed by them for the USA tour website and the program helped again to just bring awareness that we were trying to build something here in the Circle City. They also were great over the past year not just reposting of us but other supporters clubs on where to go for matches and being interactive. Lastly I(Nile) would like to thank my wife Jessica. She has had to deal with me over the past year tweeting/posting constantly. My phone buzzing all of the time when something happens. Waking up on Saturday mornings and leaving at 7am to make sure someone shows up at UJ’s. She is by no means a soccer fan(a sports fan yes but not soccer, she did enjoy the USA matches in the World Cup though) but she has been supportive of me taking on this challenge & I know it could be frustrating at some points during the past year. It has been a very fun first year and we have accomplished one of our main and biggest goals of becoming an OLSC. There is still work to be done, and still room to continue to grow but we are on the right track and if you folks keep doing what you are doing we will continue to grow and be the biggest of the 5 EPL supporters clubs in the city. Looking forward to interacting with everyone and now that we are a part of the OLSC family the opportunities that presents to us. 2 big matches coming up this week LFC travel to Madrid tomorrow 11/04 2:45pm. Then on Saturday we take on the club everyone loves to hate(and for good reason) Chelsea. 7:45am kickoff. Lets get Union Jack packed and celebrate this great accomplishment you have helped to create. This entry was posted in Uncategorized and tagged Indianapolis, Indy, Indy Eleven, Indy Reds, LFC, Liverpool, OLSC on November 3, 2014 by LFCIndy.